Tomorrow night at the AUC cross-campus rivals the University of New Brunswick Varsity Reds and St. Thomas Tommies will take to the ice in not only the 177th installment of the "Battle of the Hill" but also the 20th Annual Mark Jeffrey Memorial Game. Game time is set for 7pm. Please note that season tickets will not be honoured for this game. Tickets will be $5. Mark Jeffrey played for the UNB Red Devils (as they were known then) for four years, in 1981-82 and then from 1983-84 until 1985-86. During this time Jeffrey posted 128 points (47 goals and 81 assists) in only 76 regular season games. He was named an AUAA all-star in both 1984 and 1985 and helped lead the team to an AUAA Championship and in 1984. His 59 points in the 1984-85 season represents the 3rd highest single season point total by a UNB player. His 39 assists that same season rank 2nd all-time in team history. After his playing career Jeffrey served as the team's head coach for 13 games in the 1988-89 season. Tragically he passed away while on vacation in 1991. In his honour UNB retired his #17 jersey, created a memorial scholarship in his name to be awarded yearly to a member of the men's hockey team, and have annually hosted the Mark Jeffrey Memorial game - a game that is perhaps the most anticipated of the season by players and fans alike. - 1992-93 is the only season in which there hasn't been a MJMG since 1991-92. - UNB has played STU in 17 of the games. The only years not involving STU were 1993-94 (Acadia) and 2009-10 (Moncton). - UNB is 13-5-1 all-time in the MJMG. They are 1-0 against Moncton, 0-1 against Acadia, and 12-4-1 against STU. - The V-Reds are currently on an 8 game winning streak and 10 game unbeaten streak (9-0-1) in the game. Their last loss was a 6-3 setback to STU on January 24th, 2001, the last of 3 straight defeats. - The first two games were played in November but since 1994-95 the game has been held in January or February. - This year's game will be played on February 8th. The latest the game has been played is February 16th in 2007. - The game has never been played as UNB's season finale, but has been their 27th conference game of the year in 2002, 2005, and 2007. This season will mark the second consecutive year the MJMG will be the 26th game of the season. - UNB's biggest win was 9-0 against STU January 27th, 2009. Their biggest loss was 6-0 to Acadia on November 7th, 1993. - Colin Sinclair recorded hat-tricks in two MJMG's - in 2004 and 2007. - Recent Merit Award and Memorial Trophy recipients include: Kyle Bailey and Hunter Tremblay (2011), John-Scott Dickson (2010), Dustin Friesen (2009), Rob Hennigar (2008), and Colin Sinclair (2007). LAST MEETING: On January 18th the V-Reds played what is likely their last game at the LBR in front of 756 fans as they skated to a convincing 5-1 victory over the STU Tommies in the 176th Battle of the Hill. The final shots for the game were 41-23 in favour of the V-Reds. Bretton Stamler had 2 goals on the night, while Chris Culligan had one goal and two assists. - The first "Battle of the Hill" to be played at the AUC was on November 21st, 1979. STU won that game 7-5. - The final "Battle of the Hill" at the LBR was January 18th, 2012. UNB prevailed 5-1 that night. - UNB is currently on a 30 game winning streak over STU. 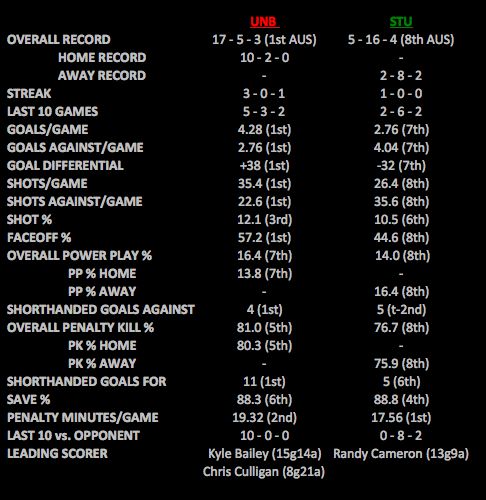 - UNB is currently on a 19 game winning streak over STU at the AUC. - The last time STU beat UNB at the AUC was February 28th, 2003 (137th Battle of the Hill). the score that night was 2-1 for STU in OT. - UNB holds a commanding edge in games with a record of (win/loss/tie) 121-47-8.
WHO TO WATCH FOR ON STU: Stephen Sanza (2G 1 A) is tied with Randy Cameron (2G 1 A) for most points against the V-Reds this year. WHO TO WATCH FOR ON UNB: Bretton Stamler (4G 1A) has been the leading performer for the V-Reds against the Tommies this year, while Kyle Bailey (2G) and Jonathan Harty (2G) are tied for second. The V-Reds defense has been stifling, only allowing the Tommies 57 shots in the three games this season (19/game). All MJMG stats and info courtesy www.vredshockey.com and compiled by Jeremy M.
Stats breakdown by Jeremy M.
Game day primer by Steven C.